I am not afraid of snakes. In fact I relish the opportunity to observe them up close … as long as they don’t mind. 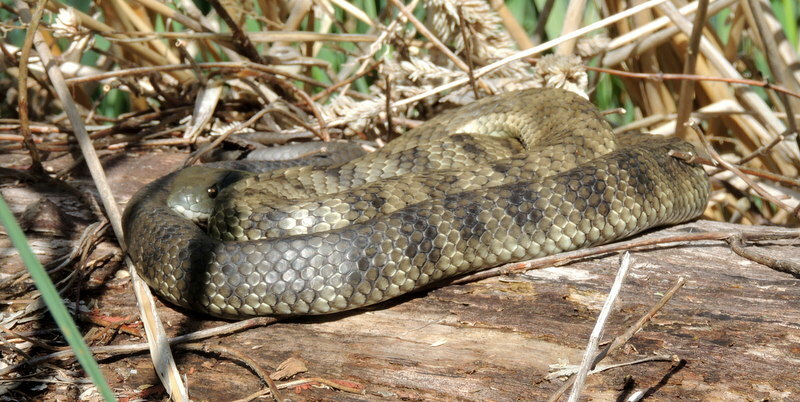 In the Yea Wetlands recently I observed a Tiger Snake (Notechis scutatus) up close and personal. It was curled up on a log sunning itself and didn’t seem to mind the attention it was getting. Having said that, when I lifted the lid on our composting bin this week and saw a snake-like creature inside I knew the world high-jumping record was going to get a bit of a shake (from a standing start!). The visitor wasn’t a snake but a Blue-tongued Lizard (Tiliqua sp). Blue-tongued Lizards are the largest member of the skink family. Being diurnal (active during the day) they are often seen but this year I have seen more than I have for many years. Blue-tongues feed on insects, snails, flowers and fruit and obviously whatever it finds in our composting bin. The chap in the compost-bin looked particularly well fed. Colour and patterning within a species is highly variable. 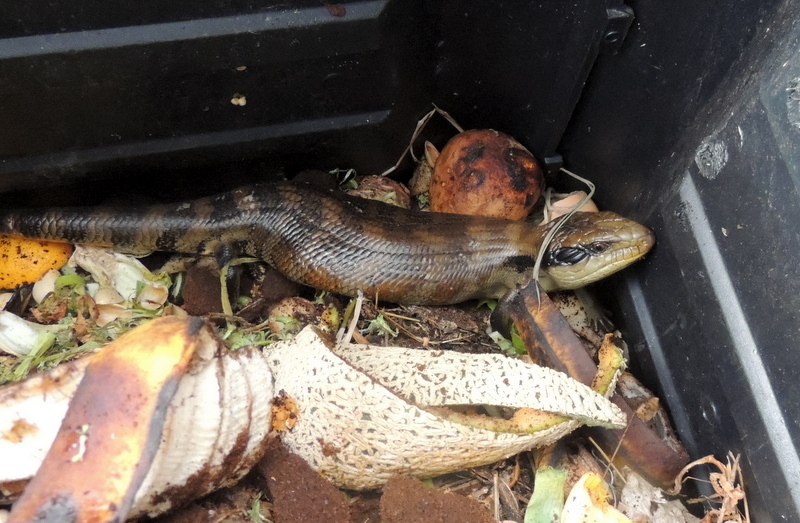 My guess is the creature in our bin is an Eastern (or Common) Blue-tongue (Tiliqua scincoides), pictured above. It is characterised by a broad prominent dark stripe from the eye to above the ear. Compare this to the lizard (pictured left) caught cruising around last week when I was riding my bike. It has no eye stripe and the patterning on its back comprises longitudinal blotches, probably a Southern Blue-tongue (Tiliqua nigrolutea). These lizards are great to have around the place because they eat insects and snails. 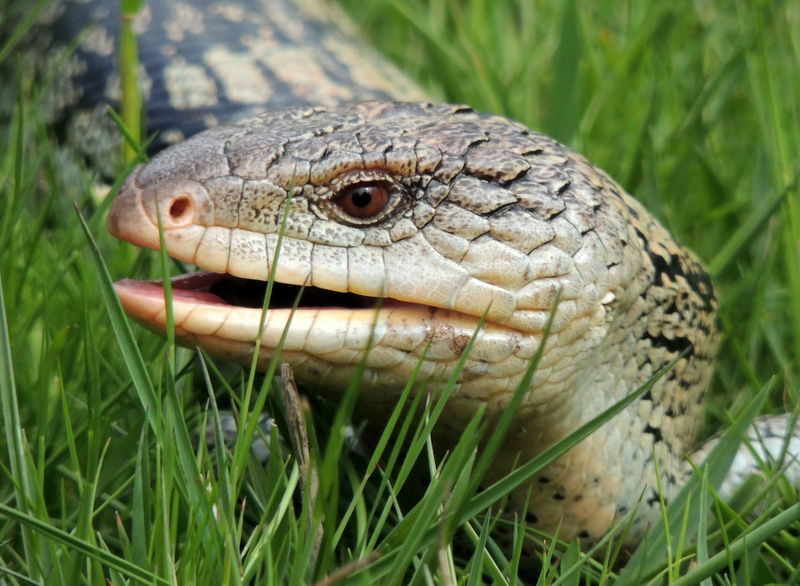 If you approach too close they will open their mouths wide and bare a dark-blue tongue as an aggression display. Poke your tongue out back at them – see what happens? Interesting that you get both Common and Blotched Blue-tongues in your area. Blotched tend to be at higher altitudes and Common at lower – maybe you’re right at the overlap zone.